Books about animals almost always seem a sure hit with the resident 3 year old (along with books about machines, of course). Combine beautiful illustrations and short crisp text, with a lead-in for a more meaningful conversation after the story, these animal books have managed to impress not just the little one but me as well, prompting me to share them here. Thanks to Lang Elliott's Songs of the Wild Birds, the Common Loon is a household name even if none of us has seen one face to face. Perhaps that's a reason why Oggie liked the Loon Baby book. A baby loon wades around with his mother who usually dives down to bring him back some food. Once, she dives and doesn't resurface for an unusually long time, which gets the baby loon very worried. He wanders here and there looking for her, getting lost in the process. When he must've felt completely abandoned and helpless, of course, the mother Loon finds him and takes him under her wing, safe and sound as always. The illustrations are gorgeous (sample at Anne Hunter's studio). The calm blueness of the watery dwelling is idyllic. The panic and rush of emotion when the baby fears he is lost is brought out beautifully well. The text, crisp and simple, flows easily for read-aloud sessions. There is plenty of opportunity to talk about what the loon could have done differently when he didn't see his mother come back when he expected her to. Atlantic Puffin became a favorite, again, thanks to Lang Elliott's Songs of the Wild Birds - it had the most surprising bird call which sounds like the whirring of a chainsaw (audio available here). A baby puffin is eager to go out on his own. His loving parents, Big Stripy Beak and Long Black Feather, tell him, "When you are strong enough and tall enough and brave enough, you'll leave the burrow all by yourself". Meanwhile, they feed him, care for him and teach him what to expect when the day comes. Am I brave enough? Am I strong enough? 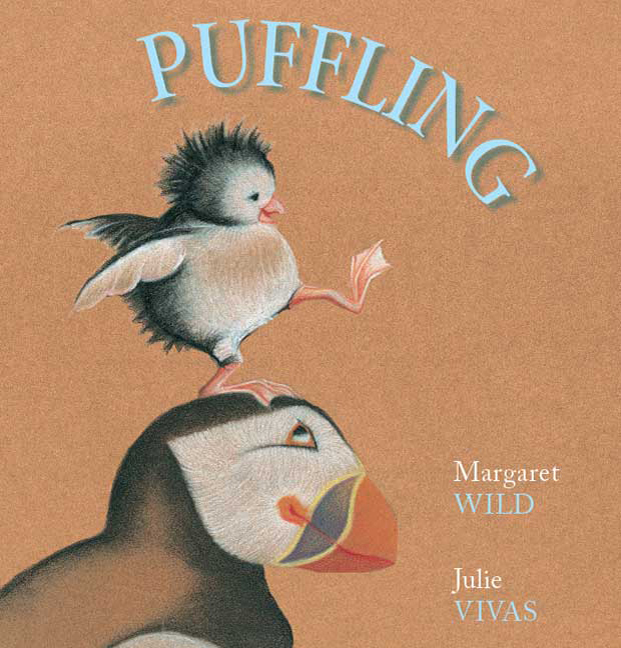 the puffling wonders as he grows impatient waiting for the day when he can venture forth independently. The illustrations are beautiful. Puffin is certainly an interesting-looking bird with bright beak and black/white body coloring ("like a toucan and penguin, mama"). The illustrations bring out not just these striking features of the mature birds, but also the fluffy softness of the baby puffin. Not surprisingly, very rarely has a picture book captured us minus the gorgeous pictures. Sort of antithetic to have a picture book with humdrum pictures, isn't it? Another wonderful book that opens up plenty of things to talk about. When Oggie wonders whether he can drive an airplane or climb a ladder to the attic by himself, it is nice to quote the puffling's anxiety and how it all works out for him when he is just ready to do all the things he has learned to do. Can't say it without feeling a certain something. They are colorful and strange-looking. Colour Colour Kamini was perhaps Og's first introduction to chameleons as we had it handy in our bookshelf after a recent trip to India back in 2009. 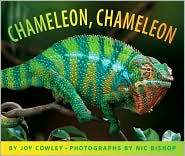 Since then he has liked chameleons and we've read a few fiction and non-fiction about these creatures, including well-beloved Eric Carle's The Mixed-up Chameleon and A Color of His Own. This is a simple non-fiction photo book with a real-life story unfolding through the pictures. A male Madagascar Panther Chameleon wanders around looking for food and enters the territory of a defensive female. Through his friendly body language he convinces her that he is not a threat and she lets him in. Therein ends the story. Nothing is mentioned of mating or procreation or life cycle. 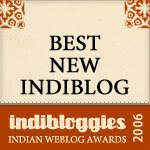 Just a simple episodic a-day-in-the-life-of style narration. The photographs are awesome. There are some notes at the back about how the photos were taken. 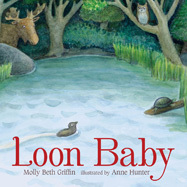 Me and the little one just read Loon Baby and Puffling following your reco. He enjoyed both of them. I thought the pencil sketches in Puffling were just awesome!